You can speed or slow an entire animation or control the speed of each slide individually. 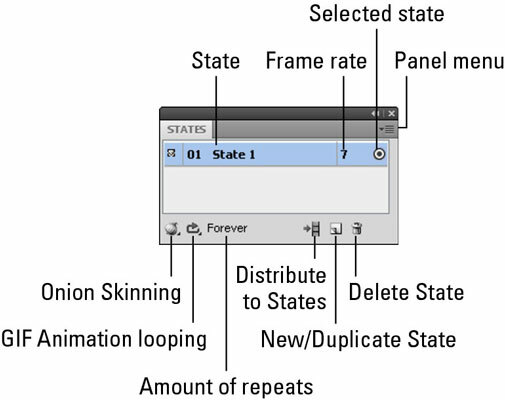 Controlling the timing of individual states can be helpful in an advertising animation, for example, if you want to keep one state visible longer than the others. You can also loop an animation. Select the states for which you want to set the frame rate. Choose Properties from the panel menu in the upper right corner of the States panel. The State Delay pop-up appears. 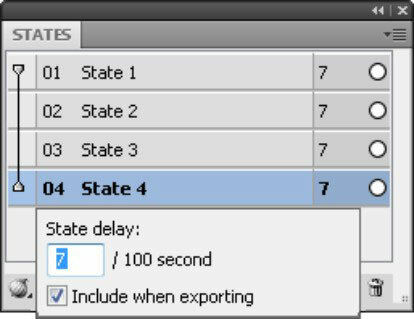 In the text box, enter a value (in 100ths of a second) to make the animation go faster or slower. The lower the value you enter, the faster the animation plays. Make sure that the Include When Exporting check box is selected. Click anywhere on the artboard to close the window. (Optional) To test the results of your frame rate change, click the Play button in the lower-right side of the artboard window. Want to display one state longer than the others? Select only that particular state and then change its frame rate to be slower than the other states’ frame rates. 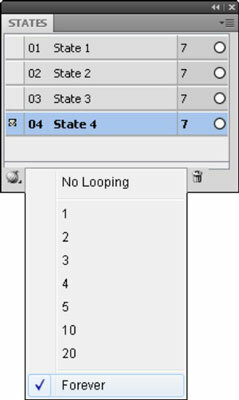 Click the GIF Animation Looping button in the lower left corner of the States panel. Choose the number of times you want the animation to loop. Save and close the animation.